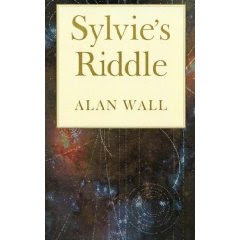 Today my friend Alan Wall's excellent book, SYLVIE'S RIDDLE is published. 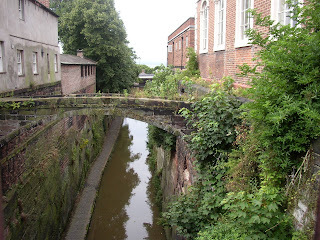 It is set in Chester and Liverpool. 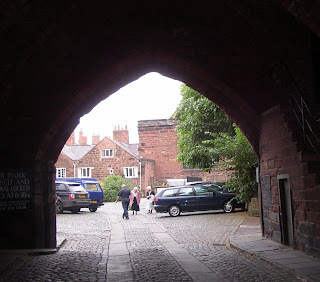 To celebrate I wandered around Chester with my camera and matched scenes with passages from the book. White, it is. Shimmering. Teeth like knives. Slicing, macerating, engulfing me, piece by piece, the unswallowed part still wriggling. Ah, such a sad end for a worm who spent all her genderless life as a he. Subsumed by slime. Gobbled on the quiet. One soft body enveloped by another. Black into white. The same old story. Know this. Be ready for them when they come. Like any other army it slithers forward on its hungy stomach. Silent, clever, Welsh - the first of its kind. Ysbryda. A paucity of vowels and a generosity of spit. A bigger mouthful than I was. It's been a long time since I last tried one of these (a story in exactly 101 words). Thanks to Debra Hamel who alerted me to this story about the newly-discovered flesh-eating slug which provided the inspiration. The decluttering has revealed stories within the vast collections of Hodmandod clutter. For instance, yesterday I uncovered about eight small screw-top plastic containers hidden in Hodmandod Major's vanity unit in his bedroom - about half of which were filled with ancient water. Apparently these were anti-incendiary devices. 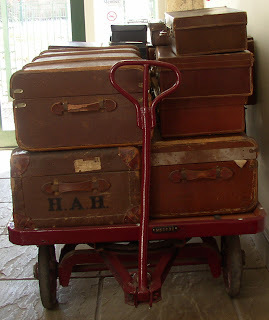 Alongside the containers were a collection of much-loved soft toys (collectively called 'The Teddies') and since these had to be left whenever we went holiday, Hod Major had devised a plan in case the house caught fire in our absence. In the event of flames, he reasoned, the plastic would melt, and the resulting flood of water would keep the Teddies safely cool until we returned. Since Hod Major is now 23 and Hod Minor 18, I am hoping very much that this plan was devised several years ago, although the water, when I sniffed it, smelt oddly fresh. 'We also used to fill up the sink, just to make doubly sure.' says Hodmandod Minor. A few weeks ago I had the pleasure of reading Elaine Feinstein's THE RUSSIAN JERUSALEM which I reviewed here. Today she kindly agreed to a short interview. Elaine Feinstein was born in Liverpool, brought up in Leicester, and educated at Newnham College, Cambridge. She has worked as a University Lecturer, a subeditor, and a free-lance journalist. Since 1980 she has lived as a full-time writer. In the same year, she was made a Fellow of the Royal Society of Literature. In 1990, she received a Cholmondeley Award for Poetry, and was given an Honorary D.Litt from the University of Leicester. She was awarded a Civil List Pension in recognition of services to literature in 2008. 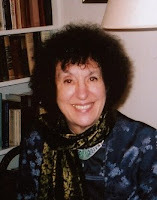 She has written fourteen novels; radio plays; television dramas, and five biographies; TED HUGHES: THE LIFE OF A POET (2001 was short listed for the biennial Marsh Biography Prize); her most recent biography 'ANNA OF ALL THE RUSSIAS: The Life of Anna Akhmatova came out from Weidenfeld in 2005. Her versions of the great Russian poet Marina Tsvetaeva were a New York Times Book of the Year. She has traveled extensively; in Russia for GB/USSR in 1978; and for the British Council in France, Spain, Italy, Rumania, India, and South East Asia. In 1993 she was Writer in Residence for the British Council in Singapore, and in 1995 in Tromso on the Arctic Circle. You can hear Elaine Feinstein reading her poem wheelchair here. EF: They eat my clematis, alas, so I have to carry them into the passageway near my garden, where I imagine there is plenty of greenery to sustain them. EF: I really don’t know. First child ? First book published ? No. Probably watching my son Martin play the flute at the Wigmore Hall, reading my son Adam’s reviews of his biography of Neruda, or my son Joel opening his letter from Trinity College Cambridge at sixteen to find he had a major scholarship. EF: That was probably the publication of my first novel. The Circle. After that...I was sure I wanted to be a writer. EF: Sadness --- that is an emotion for a gentle life. EF: Love and work--- Freud was right about that. CD: What is the first thing you do when you get up ? CD: The book is an appealing mixture of memoir, imaginative prose, pictures and poetry. Can you tell me a little about this mixture - how you arrived at it and what came first. EF: It grew like a patchwork quilt. CD: You are obviously an expert on Russian history and culture - that is one of the things I liked most about this book - its insight into what for me is a mysterious world. This is clearly a long-term interest. Can you tell me how it arose and why? EF: the late sixties I began to work on the poetry of Marina Tsvetaeva. For myself only; to learn from her ferocious genius. I sent Lyrics 1 and 8 from Poem of the End ---- which I had made using literal versions of Angela Livingstone---to Grosseteste Review, with a circulation of about 150 and was astonished to have letters from both OUP and Penguin inviting me to do a book of her poetry. Everything followed from that one piece of luck. CD: You have written several biographies of some fascinating Russian poets, and some, for example Marina Tsvetaeva and Anna Akhmatova, feature in this book. You have also written a biography of the English poet Ted Hughes. Would you say that the lives of great poets have anything in common? What makes a great poet - is it just talent? EF: Talent plus nerve. And of course dedication. CD: Your range of work is astonishing: fourteen novels, many radio plays, TV dramas, five biographies as well as poetry. Do you have a favourite medium? Does it change from time to time? Are the challenges different? EF: Poetry always first. Though novels are more fun..
CD: The illustrations by William Kermode come from a primer 'Moscow has a plan' published in 1931. They seem particularly apt. Did you have any input into the choice of illustrations? Can you tell me any more about this book? 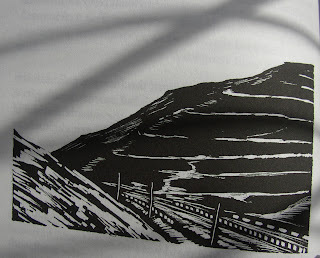 EF: The lovely woodcuts were found for me by Judith Wilson of Carcanet Press. CD: Writer in Residence for the British Council sounds to me like one of the most interesting jobs in the world. What does it entail? Do you have any choice on where you will go? Do you have any entertaining anecdotes? EF: First : You have to be invited. And then--- in the old days before cuts--- the British Council would fund your stay. Usually there are very light teaching duties---and you are expected to read your poetry in schools. I think these trousers are cool in all senses of the word. They open out quite flat then tie in two pieces around the waist. When I walk they come apart a little, and would become more daring if I put on weight, I expect (less overlap). I bought them on holiday in Portugal four years ago and I love their um...'subtlety of colour' and I think the addition of a few sequins adds an essential little extra zing. My sons forbid me to go out in them, however, so I am displaying them on my blog. No one will ever see them there. 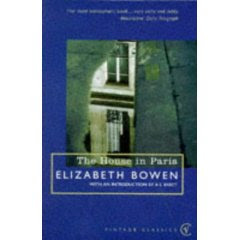 Well, Salonists, I am happy to report that I actually finished Elizabeth Bowen's THE HOUSE IN PARIS. This book started somewhat mysteriously with two children being left in the house of a confirmed spinster in a house in Paris sometime in the early twentieth century. For several months I had worked through these few pages, a few sentences at a time, enjoying it, but for some reason not getting on with it, although I had no intention of abandoning it. In fact I read several other, faster-paced books at the same time. And, all the while, at the back of my head, these two children talked to each other and to the woman and to the elderly woman who was bed-ridden upstairs, and I got the idea they'd both been abandoned somehow - through death and misfortune. Then, last week, I got onto part two - which turned out to be the main story of the book - one that happened ten years before the initial part of the book, and is about the denial of love. Karen, the main protagonist (who is engaged to Ray who has had to go overseas) has been invited by Naomi (who is the spinster in the first part of the book) to tea with Naomi's fiancé, Max. These three, Max, Karen and Naomi, are old acquaintances. Karen is wary of Max and has been reluctant to meet him again - and only does so to please Naomi. As usual Max and Karen spar with each other, and once again Karen is hurt while Naomi tries to maintain peace. The following scene is pivotal and my favourite part of the book. They are having tea outside the old house of Naomi's late aunt and it is almost time to go. Naomi has gone inside to answer the door to someone while Max and Naomi remain sitting under the trees. '...There was nothing left to do but lock up the house; they ought to start back soon. The poplars, the crimson-showering cherry, the lawn, the window belonging to the past already. An indoor chill, like in some room where nothing ever goes on, began to settle on Karen. "We'll bring the tray in when we go." But they both sat back, her hand near his. Max put his hand on Karen's, pressing it into the grass. Their unexploring, consenting touch lasted; they did not look at each other or at their hands. When their hands had drawn slowly apart, they both watched the flattened grass beginning to spring up again, blade by blade. That act, on its own, simply stated and then left there, stayed in my mind. There is no description of thought or feeling, but just that statement of the way they watched the grass rebound - it is terse, powerful and significant. There is more fine writing in this very fine book. 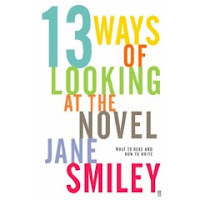 I found it on Jane Smiley's booklist in THIRTEEN WAYS OF LOOKING AT A NOVEL (another good book I haven't finished - but that book is very long) and it makes me want to read the rest of her suggestions. Since then I have started another good book: NOW YOU SEE HIM by Eli Gottlieb. This is a much easier book and the pages are turning far more rapidly. I am two-thirds of the way through after just a few hours - as Ann Patchett says, it is a literary page-turner. It is about friendship, marriage and family with stunning descriptions of grief and bereavement. A businessman becomes infatuated with an actress he has employed to teach him English. However she looks down on him because he doesn't really fit in with her Bohemian lifestyle and views. When he shows an interest in the art of one of her friends she believes that he is commissioning the work just to impress her (a fair assumption); but he is not. It ends well. His two bodyguards provide interesting sub-plots and some comic relief. Perhaps not a truly great film but an interesting and satisfying one. ...and feeling very jealous that Ali and Nic went and saw them live at Liverpool - even if the main event wasn't on the stage for long enough. A book about friendship and the business of writing so far. The writing reminds me of Richard Ford's - which I also like very much. Contemplating starting another novel - just for the hell of it - and because I desperately want to. It's in my head and I know that really it should stay in there, because I am trying to keep normal and sane - but I don't think this is going to last. 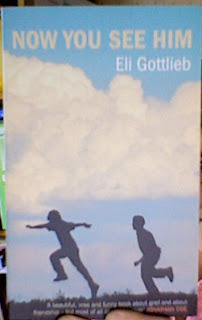 Going down to London again next week to have lunch with Eli Gottlieb (author of the above) and quite a few others, I expect. I've had several of these already over the last few days - now wondering if I opened the attachment...I don't think I did. I guess I'll find out soon enough if I did! Peter Tallack was at the journal Nature for ten years, followed by three years at the publisher Wiedenfeld and Nicholson and then seven years at the literary agency Conville and Walsh, where he was a director. 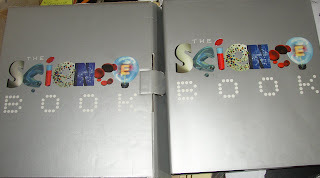 More importantly, he is the author of two books - one of which we happened to already have in the Hodmandod Household - The Science Book. This is a beautiful book, lavishly illustrated. All of this is great experience for a literary agent and I feel very fortunate that he's taken me on alongside such a list of excellent writers - several of whose books I've read and much admired. Just finished THE HOUSE IN PARIS. It turned out to be fabulously intense book, with a very interesting structure. The first part set the scene for the main tragedy that occurred ten years earlier. The last part returned to the children; but because I then knew so much more about the genesis of one of the children I read more intently. It's a satisfying book, and incredibly involving and moving. At the end of it I feel so exhausted I can't say much. It was demanding - a quick google reveals that some people likened it to a Henry James - but definitely worth the effort. Even if it does take you four months to finish. I've been meaning to write a post on the Author's North day at Carnforth on the 4th July for some time. 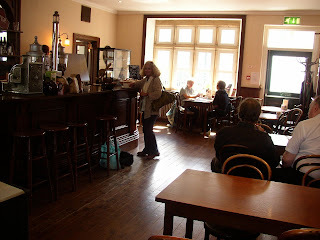 Carnforth is about 70 miles (I'd guess) north of where I live; and I went with my friend Jan, a fellow-writer, by train. This was a particularly appropriate choice of transport because Carnforth is the location of the famous film BRIEF ENCOUNTER directed by David Lean (clip above). Carnforth Sation. 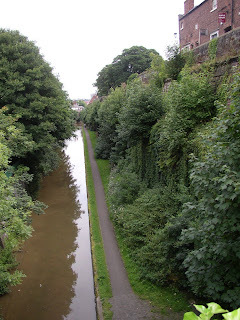 One of the reasons the station was chosen was because it had a suitable slope for romantic adieux. As far as I remember a housewife called Laura finds a mote of ash from a steam train in one of her eyes and a passing doctor called Alec helps her remove it. Following this moment of brief intimacy they embark on a chaste affair - full of meaningful glances, pregnant pauses and things unsaid. Eventually, after much soul-searching, they decide not to run away with each other because they both have responsibilities and she returns to her claustrophobic life of clipped vowels in the suburbs while he decides to go out to Africa. There are no car chases. The café (here modelled by Jan who sets it off very nicely, I feel) has been reconstructed and based on the original set. To me BRIEF ENCOUNTER has always epitomised English stiff upperlipness. I saw it once, on the TV, as a child and I remember thinking then that the heroine, in particular, needed a good talking to. Everyone seemed to be clenching every muscle that they owned, and nothing much seemed to happen - I suppose I was too young to appreciate the subtleties. I have never had any desire to see it again (and yes, I know I've got it on my favourite movies list - this was just so I could make a tongue-in-cheek coupling with FIRST ENCOUNTER). However, Jim Friel's talk made me think about this anew. In fact he talked so enthusiastically about it, relating it to his experiences in transposing THE REMAINS OF THE DAY to Radio 4, that I am willing to give it another try as I approach my dotage. It was an excellent talk, and reminded me why teaching alongside him at Liverpool John Moores University was such a pleasure. I am sure I learnt just as much as the students. Jim is also the author of three novels (TAKING THE VEIL, LEFT OF NORTH and CARELESS TALK and several short stories and is the winner of a Betty Trask award. All of his novels are edgy and provocative with believable and fascinating characters. My favourite was TAKING THE VEIL which featured a murderous nun. He has recently won the Llura Press Fiction Quest with THE HIGHER REALM). 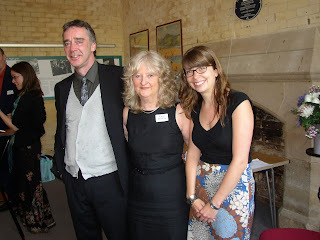 ( In the above photo, Anna Ganley is in the background, Jim Friel, Carol Clewlow and Sarah Baxter. Sarah and Anna are committtee representatives from the Society of Authors). He was introduced by Carol Clewlow (who wrote A WOMAN'S GUIDE TO ADULTERY which was made into a series on TV a few years ago. Her latest book is NOT MARRIED, NOT BOTHERED) who in turn was introduced by me. The thought of all this introducing amuses me still - I think it all went very well, though. ...and I'm taking it easy - just reading THE HOUSE IN PARIS which is getting more multi-faceted and pretty wonderful. There are now 200 Sunday Salon Members! Thank you Debra! Every week there seems to be an added feature - it just gets en-bettered* every time. *word copyright D. Hamel 2008. Does anyone else find that some books take a ridiculously long time to read, especially at first? 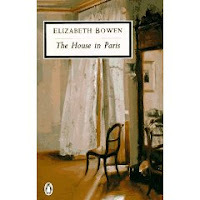 For instance, this morning, I read another few pages of A HOUSE IN PARIS by Elizabeth Bowen. I see from my Revish reading list that I began this book on the 22nd March - almost four months ago. I keep reading a little and then putting it down. It is the sort of book where nothing much happens, and yet somehow it is too intense, like a particularly delicious dessert. I can only take so much at a time. It reminds me a lot of Anita Brookner's work - an author I used to read a lot, but then realised I felt like I was reading the same book again and again. Some authors do seem to write on the same theme, I think. 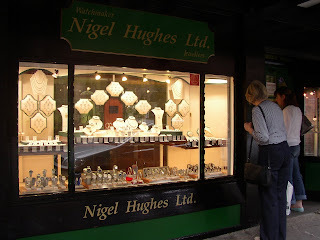 Each one is a gem, but variations of the same gem - different shades of sapphire perhaps. There is nothing wrong with that, in fact it might be good, but if you reach their whole oeuvre all at once, things seem to become a little too familiar. But I have become side-tracked - back to the Elizabeth Bowen. I am about a third way through this book and I can see it is atmospheric. Every time I pick it up I am immediately submerged in its stifling atmosphere. It is about, predictably, a house in Paris, and in this particular house two English children, Henrietta and Leopold (who are strangers to each other) are waiting for relatives to pick them up and continue their journeys. Their temporary guardian is a spinster aged about forty called Miss Fisher, and she has a mother who is teminally ill upstairs. This illness is infecting everything. Every action is pondered over and then usually curtailed. Conversations are stilted because every word that is uttered is examined by the children. They are curious creatures, these children, unrealistically wise beyond their years; when they are hurt they swallow that hurt manfully (or womanfully); when they play they do so with restraint. I hope I am not making this sound like an unattractive reading experience, because it is not. The last couple of pages have been almost unbearably tense. Someone came to the door and the maid answered. We followed the door shutting and then the maid's steps upstairs. We then heard her encountering the spinster on the landing and the two of them interrupting each other in French. This sort of thing goes on for another page so at the end of it the reader feels the same desperate anticipation as the children - and is not disappointed. 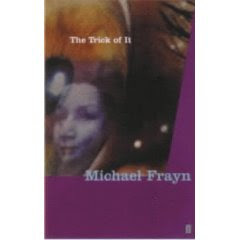 Well, I've just finished Michael Frayn's THE TRICK OF IT. As Ian McEwan said, it is about the creative process - but not in the way I thought it would be. It is not a homage, but a recognition of a sort of mania. It is incredibly moving and I feel a little numbed by it; I think because I identified with it quite a lot, and it confirms what I've learnt over the past few years in this writing business. Like the narrator in this short book I used to think there was 'a trick' to this business of writing fiction; that the rest of the world knew, and that one day, if I worked hard enough at it, I would find it too. But there isn't; and if you think there is, and if you think you've found it then you have lost. All we can do is create alone, and be true to ourselves...I think that is the message. Also we have to be obsessed, and we have to be prepared to lose everything else. Why do it? What causes us to make such a sacrifice? I think (apart from the fact there is no alternative to someone so possessed) lies on page 115. The narrator (who is married to a novelist and has started to write his own novel too) is in one of the Gulf states and he knocks into someone carrying water. The water falls onto the ground and quickly evaporates. Which is, I suppose, why I write books, papers, articles...and this blog. It is not about generating traffic or readers - it is about creating something that will leave more than a trace - a kind of stain to show that I was here. Today these came...and yes, I know, I definitely wasn't going to buy any more books...but somehow I did. Well... 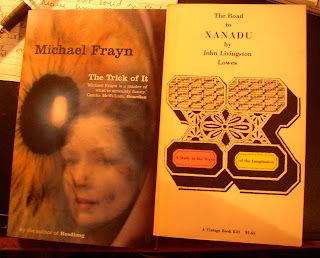 I do so love Michael Frayn's work, and Ian McEwan did mention this book (THE TRICK OF IT), and it did sound good...and yes, in the end I also succumbed to THE ROAD TO XANADU by John Livingston Lowes because when I did a Google search I saw it mentioned Poincaré and Coleridge on the same page, and when I told my Very Intelligent Friend about this little discovery he (of course!) knew about it already, and made it sound so intriguing I had to get it. So I did. I am not disappointed. Sometimes weak moments are a very good thing. 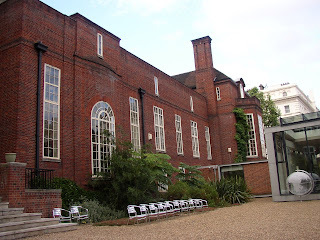 then over to the Royal Geographical Society in Kensington. The debate was on 'What drives writers and scientists?' a question of interest to me since I have experienced a little of both. It was organised by English Pen and the Medical Research Council and featured Ruth Padel, Chair of the UK Poetry Society and Fellow of the Royal Society of Literature; Sir Aaron Klug who won a Nobel Prize for his discovery of the structure of the Tobacco Mosaic Virus and Dr Sheena McCormack a HIV researcher at the MRC Clinical Trials Unit. It was chaired by Sîan Ede, Deputy Arts Director of the Calouste Gulbenkian Foundation. Sir Aaron Klug spoke first and said that inspiration had come to him in two different ways: both as a flash of insight (his realisation that it would be possible to determine a 3D image from a set of 2D X ray images - which formed the basis of the X-ray CAT scanner) and something he had worked on over a long period (the gradual elucidation of the structure of the Tobacco Mosaic Virus). The Tobacco Mosaic Virus has an interesting shape - a little like coaxial cable on first sight - the RNA moelcule in the middle and the protein overlapping like slates on the outside. Sheena McCormack talked about her very interesting and worthwhile work on a vaccine for AIDS. For a second or two I thought I had missed this great discovery - but no, she told us that there had been a series of disappointments, and they had not found one yet. She advocated brainstorming as an essential tool for her creativity and also mentioned that paperwork has a stifling effect. I have long been an Ian McEwan fan and, after hearing him speak, think even more of him. He had been asked to join the panel at short notice but even so he had managed to compile a fascinating list on what the creativity process in science and literature have in common. These included persistence; tolerance of drudgery, luck, playfulness, ambition, muddle, and a kind of abandonment to a determined stupor. He then went on to consider how the territory of literature and science are now merging and to some extent swapping over. Emotions are being studied by neuroscientists, for example, and are no longer the exclusive preserve of the novelist. Science and literature are bound together by an investment in human nature, and in truth and beauty. 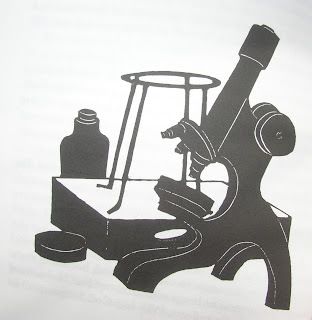 He says that science becomes open at the point where the layman can see its beauty and truth. On the subject of general creativity he mentioned the concept of a compellingly beautiful idea - that some ideas are too beautiful not to be true and he also remarked that creativity has a tendency to become a habit - so much so that Hardy wrote a poem on his death-bed. On the subject of responsibility (which came up in the discussion at the end), he said that the novelist has to be internally coherent. Even if a book is a fantasy it has to be true to its own logic. In realist novels the characters have to be socially recognisable. While Ruth Padel said that poets have to be true to their own imagination. At the end Sîan Ede challenged the audience to think of an ugly idea in science - as a counterbalance to the idea that if it is beautiful it must be true...but I don't think anyone came up with anything. 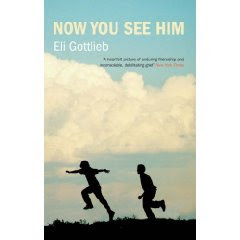 I just received this book - NOW YOU SEE HIM by Eli Gottlieb - from the publisher Serpent's Tail and addressed to Clare Dudman, 'Keeper of the Snails' - a pleasant surprise - and much appreciated. Now I have much liked all the Serpent's Tail books I have read so far, so I am looking forward to reading this one. 'Beautiful, wise and funny' says Jonathan Coe. It looks like just the sort of thing I love. 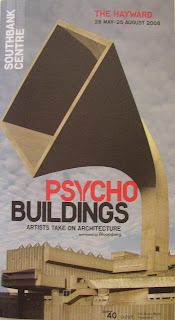 On Thursday I went to the Psychobuildings exhibition in the Hayward Gallery, London. Since I could not take pictures (except on the roof top) I have resorted to taking pictures of postcards. The quality is not very good, but I think it gives an impression. There are some better pictures from the Guardian here. Ernesto Neto, from Rio de Janeiro, works in net. Black mesh stretched over plywood struts. The struts are like the bones of a dinosaur model my brother made once; so I at once thought of bone, and from that a cell, and I imagined how it would be to walk into a cell; the soft double layers, the drooping structures of processes transporting proteins to the outside, and there, above me and around me, small tunnels through to the surface, small molecules coming in and out, out and in. Porous like that tubing I used once in a biology class. Pause inside and everything else disappears. The twilight brings a temporary peace. It is best to be alone. Best to stand beside one of the processes subsiding from the ceiling filled with lead and cloves and inhale. Christmas and my father treating a rotten tooth. Watching while he groaned and thrashed around like an injured bear. Then my brother taking the pieces of wood and rubbing them smooth. The bones interlocking and father's sighs. The time that was is gone - a time I thought I'd lost but now comes back fragmented and inaccurately remembered. All that matters is this: that my father's tooth is numbed and the dinosaur that my brother is making will stand upright on its own...when his hands drop away. And go. 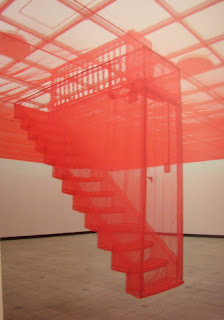 Do Ho Suh comes from Korea and now lives in New York. His past crashes in. One fifth the size of reality. The fragile Korean house with its rice paper windows and doors remain intact and yet the bricks and mortar of the New York apartment block are shattered. Three floors. Three levels of affluence. At ground level a stylish austerity - space, expensive furniture and high quality fittings. The middle floor is more intellectual and stuffy. There are desks, book cases and pictures on the walls. While on the top floor things are exactly as they appear without embellishment. The kitchen is unfitted and basic. Posters are stuck on the walls and a table serves as a desk. I spent a long time looking, fascinated at the detail and what it means. The East colliding with the West and surviving spectacularly. The levels of wealth in western society and the Korean house - each disrupting the other. A clashing rather than a merging. A sense that the two are too different to mix. Or maybe this is how Do Ho Suh feels - as if he is forever on the outside looking in...and maybe that is how we all feel, or at least how I feel. On the outside of everything I do. Michael Beutler, a German who lives and works in Berlin, takes mesh panels and covers them with florists' paper. He then shapes and distresses them with his feet before using them to construct a forest of shapes and passages. It is easy to lose yourself here. Easy to become distracted by the different colours and shapes. The views change. Dark becomes light. Red becomes black then blue or yellow. There are spaces you can only see and not enter. The inside becomes the outside. 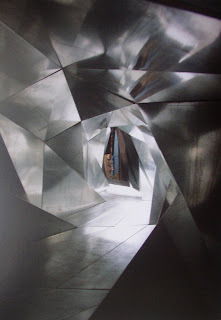 There is something of a mobius strip at work here - the cave becomes a hollow becomes an exterior wall becomes a cave again. Turn a corner and there is the artist himself still measuring, photographing, maybe even constructing in his mind, and changing it again. A poem, I think. Up until now I have seen prose but now I see the hints of a place so that must be a poem. Abstract, still under construction. 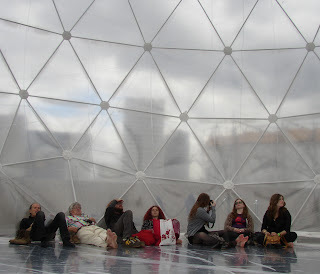 In fact the construction is part of the place, like a shell that is continually being made. Maybe it represents those parts of us that are never happy and always seeking to improve. Atelier Bow-Wow is a consortium of Japanese architects. Their tunnel is made of steel plate. It creaks and rumbles like the big steel drums I heard once - washed up on an Arctic beach, shifting with the tide. It has the plaintiveness of birth, the lights and the sounds reverberate and promise like a type of pain, long before the head emerges. Even though the ceiling is high you come out stooped, cautiously peering around you, slightly dazzled by the change of view as you leave one gallery and emerge in another. Stand beside the exit and it is like witnessing a multiple birth: a litter of people, one and then the next - looking around, inspecting. Something outside comes in. It breaks through the walls and they implode too...Yet there is nothing there. Nothing to cause this breaking through, and the melodrama of furniture breaking, beds upturned, wood splintering...everything broken apart and frozen in its journey through the air, suspended by Los Carpinteros (two Cuban artists) on transparent fishing line. Nothing moves except this - a single piece of broken cinder block suspended on a line - which is light enough for the faintest breeze to make it rotate slowly on the spot, and, as it turns, I watch. When I saw the name Rachael Whiteread (a London artist) I was expecting a 'little something' in concrete. 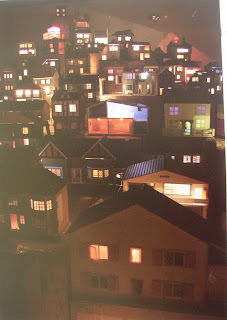 Instead I found this - a miniature village assembled on packing cases in a darkened room, individually manufactured doll's houses, gathered from attic clearances and toy fairs - and lit from within to stunning effect. Of course I immediately imagined there were people watching. Each lit door and window had eyes. However when I peered inside they disappeared, each tiny room mysteriously empty, which added another sinister dimension. An empty village with no one here. But the lights still on. Why? An enticing question I would love to answer. The Austrian artists called, collectively, Gelitin specialise in 'audacious interventions'. 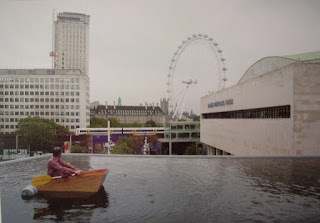 In this case flooding one of the terraces of the Hayward Gallery with 120cm of water and floating some packing-case like rowing boats on the top. Fortunately for me there was another stray humanoid on her own viewing this exhibition and we decided to share a boat. So it was that I came to float around on a rooftop in central London with a woman I can barely remember even now. She was taller than me, and much younger, with a central European American-flavoured accent. She was also a better rower. She rowed out and I was supposed to row back but we ended up just going around and around in circles so she took over again with a laugh. 'I learnt to row in London,' she said, so I told her that I normally rowed in the gym, which is not quite the same thing. But we made it back after our terrifying little adventure, and didn't get wet. Which was good. And now another floating room - of red mesh, meticulously made, even the light switch and the wiring picked out in seams and padding. 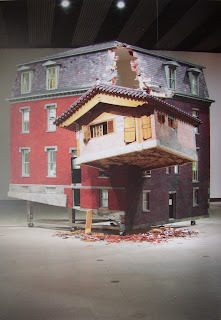 Do Ho Suh, a Korean artist, lives and works in New York. These days he has assistants to realise his visions, but originally he used 'old ladies'. The thought of them making these imaginary rooms is almost as surreal as the room itself (which sways and stirs in this top-most space, the intricately-worked banisters shifting slightly against each other). What did these old ladies make of what they were sewing? Did they enjoy stabbing at this strange scarlet net? 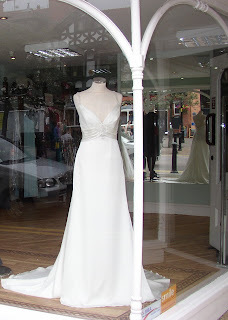 Or did they long for taffeta and silks, wedding gowns and ballroom dresses? Instead of this strange stairway no one can climb, did they long for velvet and the sound of feet on polished floor? Or were they happy with this translucent demarcation of space where the only dances are imagined - and old feet tap out the rhythms just as fluently and daintily as they did forty years ago. is a more altruistic work - a cinema that screens films by other artists. Outside it is just another pavilion; inside it is lined with pieces of overlapping plywood carved into sinuous shapes of the profiles of faces. It reminded me of the the corrugated flesh of the lining of the stomach. The chairs were made from the same particle board as the lining of my shed so I was impressed immediately. There was the familiar smell of wood and the perfume of home - I shut my eyes for a few seconds and London faded away to a forest. 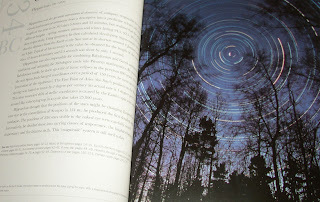 When I opened them the ceiling had changed from pale blue of day to a night sky full of stars. Tobias Putrih is Slovenian and now lives in New York and says that the cinema auditorium is an almost overlooked place of transition. 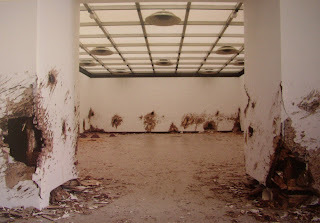 One room leads into another - white-painted, panelled, and lined - perfect except for the holes and the rubble the dents and the 'rabid destruction'. I look around, feeling envious of whoever did this. What a glorious vent for anger, what a great antidote to frustration - better than any punch bag - the perfect white wall...and a sledge hammer or mallet...and a strong pair of arms. I just want Mike Nelson to know that any time he needs help with one of his projects I am available. I would work for free, willingly and very happily. Oh, the satisfying crunch, that crash, this is what I think about your opinions, this is how much I care...Am I so uninteresting now? Have you still lost your enthusiasm for my work? The plaster crunches underfoot, and I pulverise it a little more, twist once and it is dust, twist again and it is finer still. A strong breeze and it would be gone. 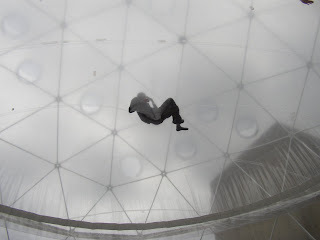 Tomas Saraceno, an Argentine now working in Frankfurt, has an on-going project to create a floating metropolis in the sky. 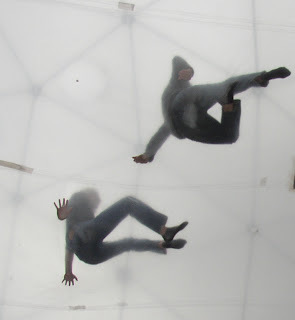 For now he has to settle for this: a hexagonal inflated translucent tent. Only a few people were allowed aloft and that was through lottery. I was not lucky. Still, the climb up looked very slightly precarious and anyway after rowing around the roof top I was tired of high adventure, so I was content just to take off my shoes, go through the air-lock and watch the antics of the 'luckier' visitors above me. These visitors of course, become part of the art. Their shapes and outlines constantly move and change. They shift on the cushion of air, bounce and crawl to find balance, and they look down on us. 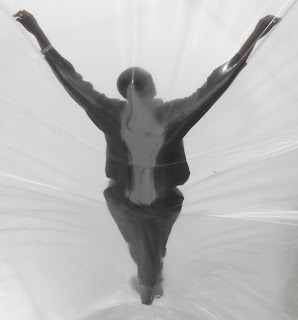 'Utopia', Saraceno says, 'exists until it is created.' That is true I think. When dreams come true they are no longer dreams. the 'winning' removes something - a desire to win. It is as though the pinnacle has been passed, and the desire to win is more powerful than the accomplishment of winning. Sometimes it is better, more piquant, to just hanker after climbing to a summit - once you get there the mystery is gone and there is nothing left to find. This book comes highly recommended by Margaret Atwood and Zadie Smith. 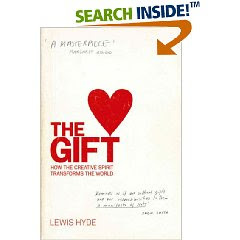 It has a subtitle: how he creative spirit transforms the World. Chapter 1 looks at folk tales about gift giving. Traditionally, gift-giving is circular. In the Kula community of New Guinea two types of gifts are passed around in different directions. For the women there is a string of red shells, while the men have a bangle made from a large white shell. Gifts are never kept because then they lose their power. The giver is the one that accrues benefit. In the Maori society the circle includes the forest; when the forest yields food than a little of what it yields is given back. This, Lewis Hyde says, is the start of ecology. Man is part, rather than lord, of his environment. 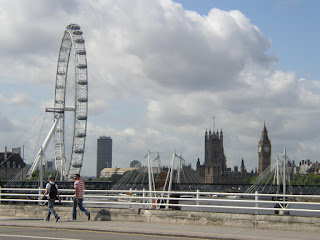 Off to London early tomorrow...so a short blogging hiatus. I shall have lots of catching up to do when I get back. 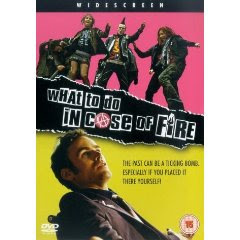 What To Do In Case of Fire. A moving film about six German anarchists. Slated as a 'comedy' but was entertaining rather than funny. It was about youth, friendship, loyalty and getting a second chance to do what's right. Highly recommended. A weird mixture of Eastern Indian music played USA-style. 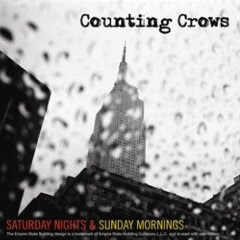 Strangely addictive and very good 'working music'. It makes me feel like I should be sitting on a sequined cushion in purple and red silks smoking pot. 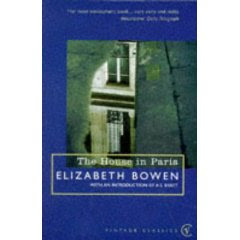 The House in Paris by Elizabeth Bowen (an on-going project of several months now). An atmospheric work involving, so far, two children in a strange house...in Paris. Editing an intriguing manuscript (someone else's). 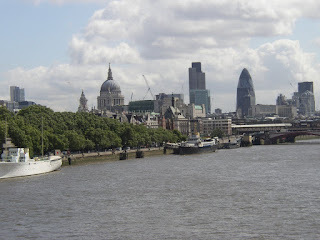 Going to see PsychoBuildings - an exhibition in the Hayward Gallery in London and then the Pen/MRC debate with Ruth Padel and Aaron Klug on Creativity. Last year I enjoyed myself answering some questions. This year I have made up some more. If anyone else feels like answering them too, please let me know so I can take a look. What can I fit in the space between the stars? What is the first thing you know that you saw? Can I really smell the rain? When does white noise become dark? Where did you leave your favourite dream? How can I stop feeling the lashing of a tongue? Why do some words stain with an indelible ink; while others leave no mark at all? 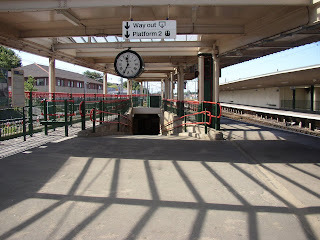 Off to Carnforth tomorrow, to see the station where 'Brief Encounter' was filmed (with 'Authors North' - a Society of Authors splinter group). Jan is coming with me. 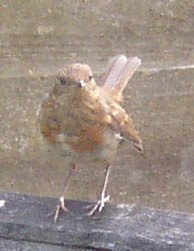 I have a friend who lives in a square of modern terraced houses facing onto a collection of garages and small gardens. I have often thought how much fun it would be if all of the houses were occupied by writers, artists and scientists, and the garages flattened to make a small meeting place and one big garden. I imagine ideas would ignite like small sparks until the whole place was ablaze with ideas. Or maybe it would not be like this at all. 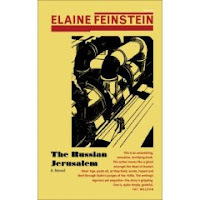 Maybe it would be like the 'Writer's House' in Elaine Feinstein's new book THE RUSSIAN JERUSALEM - quiet, oppressed, the occupants suspicious of each other and furtive. But in THE RUSSIAN JERUSALEM this oppression comes not from jealously-guarded creative secrets or rivalries, but from the state. This idyllic-sounding 'The Writer's House' is something the government has created, and in the time that Elaine Feinstein describes it, is slowly being taken apart. People disappear, and those left behind are too afraid to ask why. While some stand up to the oppression, others connive, while yet others are merely suspected of conniving. The intrigue is poisonous, and desiccates their ink. 'All poets are Jews.' Marina Tsvetaeva said, and perhaps, if 'Jew' represents the oppressed and dislocated, she is right. Not only poetry, but any form of creative expression seems to flow more fluently from those who are different and who have to work at this business of survival. "Your words Marina." "But from your own life?" over the snow to school as a little boy. 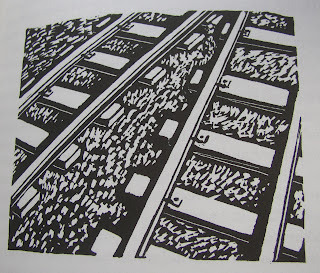 By the end of the book, which is beautifully illustrated with wood-block-style drawings by William Kermode from 'Moscow has a plan : A Social Primer', I had a strong impression of certain aspect of recent Soviet history. It is complicated, and I think it will take me a long time to absorb and understand the rest. But this book, with its tense evocative scenes of Petersburg, Odessa and Kiev under Stalin, Brezhnev and Yeltzin, makes me not only want to know more, but go there too.